CareerCast.com, an online career resource for finding targeted job opportunities by industry, function and location, named "audiologist" as the #2 job on its list of "The Best Jobs of 2015." U.S. News & World Reports cites Speech-Language Pathologist as one of the top best jobs in the country and one of the top 5 best social services jobs. For more information visit the Department of Speech and Hearing Science website. Have a question about Speech and Hearing Science or want more information? Let us know. 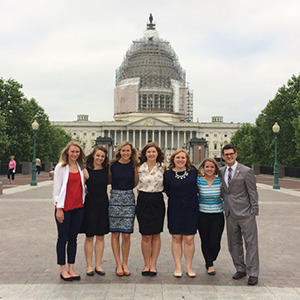 The Ohio State University chapter of the Student Academy of Audiology (SAA) descended upon Capitol Hill, May 28-31, to lobby on behalf of audiology issues. Students were accompanied by the governmental relations staff of the American Academy of Audiology, Kate Thomas and Marilyn Richmond; and Tanya Tolpegin, executive director of the American Academy of Audiology. The visit marked the third annual student-directed advocacy trip for Ohio State SAA. 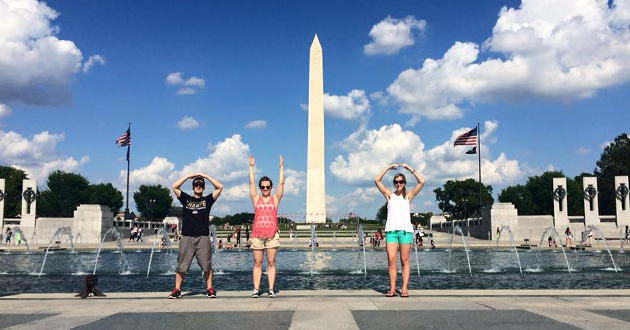 The Ohio State chapter is the first to embark on an advocacy trip to Capitol Hill, and since then, multiple SAA chapters have taken up the charge to coordinate trips of this nature. The trip is funded through student fundraisers and generous donations from Ohio State’s Department of Speech and Hearing. Students pursuing a major in Speech and Hearing Science are introduced both to basic and applied research and to clinical applications. Professional career paths include speech-language pathology, audiology and basic or clinical research. Speech-language pathologists and audiologists are professionals who work closely with teachers, physicians, psychologists, social workers, rehabilitation counselors and other members of an interdisciplinary team, but they are autonomous and do not work under direct medical supervision. They provide professional services in a wide range of facilities, including public and private schools, hospitals, rehabilitation centers, nursing care facilities, community and university clinics, private practice offices, state and local health departments, home care, adult day care centers, centers for the developmentally disabled, research laboratories and industries. Survey of the topics, methodologies and applications of speech and hearing science in normal and aberrant communication; lectures and readings. Provides articulatory and acoustic descriptions of speech sounds and a comparative study of phonetic transcription systems. Designed to teach the basic principles of acoustics to undergraduate students in the Arts and Sciences who have had little previous experience with math or biological and physical sciences. The student should gain an appreciation of the concepts underlying the generation, transmission and measurement of sound waves traveling through air. Introduction to language acquisition in normal children. Exploration of the development of communication skills throughout the life span and the consequences of communication disorders for individuals, their families and their communities. 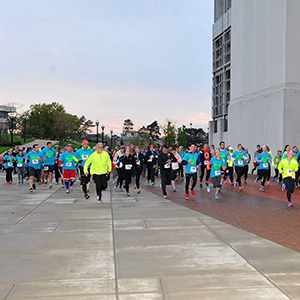 The Hustle For Hearing 5k race and 1 mile walk is put on each year by the Ohio State University Chapter of the Student Academy of Audiology (SAA). 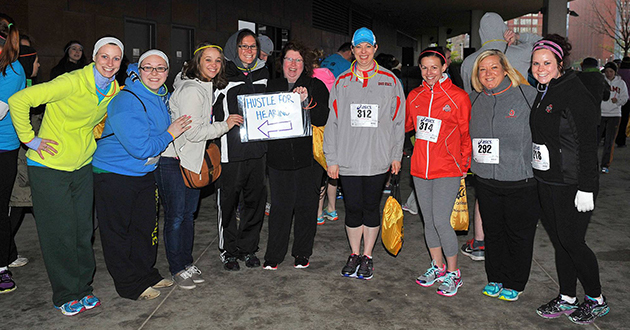 Each year SAA chooses to donate proceeds from Hustle For Hearing to organizations and programs which strive to improve the quality of life for individuals with hearing loss. This year, SAA chose to donate proceeds to campUS, a transition camp for teenagers with hearing loss and their families organized by Ohio State’s Speech-Hearing-Language Clinic. The National Student Speech-Language-Hearing Association is sponsored by the American Speech-Language-Hearing Association (ASHA), which oversees professional certification of audiologists and speech-language pathologists in the United States. The Ohio State chapter typically sponsors a number of activities each semester for students who are interested in gaining additional information or experience in areas related to Speech and Hearing. The Student Academy of Audiology (SAA) welcomes undergraduates interested in exploring further study in audiology. SAA is a student-run organization sponsored by the American Academy of Audiology, the national professional organization for audiologists which seeks to further the profession of audiology in the United States. The Acoustical Society of America Regional Chapter at Ohio State is an interdisciplinary organization that supports acoustical research, promotes awareness of sound related fields, discusses technology development and provides a forum where acoustics may be examined. ASA@OSU is a student-run organization where guest speakers from many areas of study are scheduled to present on a topic related to acoustics.